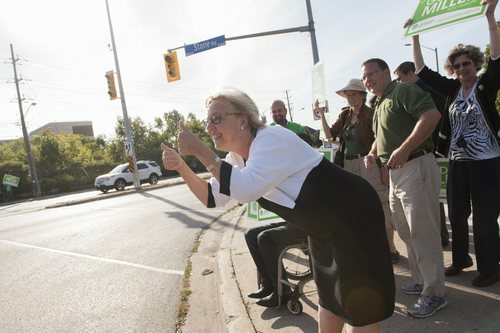 Green Party Leader Elizabeth May gives a thumbs up in Guelph, Ont. 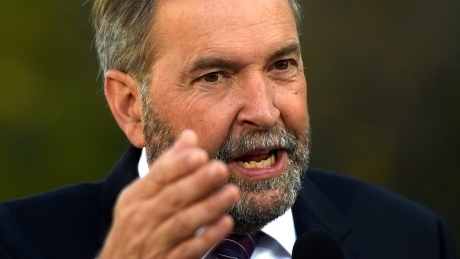 The New Democrats are set to unveil their much-anticipated fiscal plan today, one day ahead of the economy-centric federal leaders' debate in Calgary leading up to the Oct. 19 election. 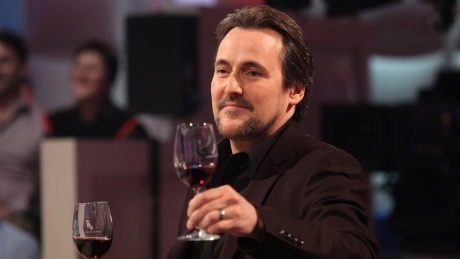 It's going to be a reasonable increase; it's not going to be a shock to the system. 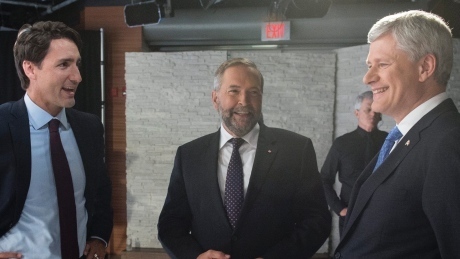 The three men from Montreal vying for Canada's top seat will appear on Radio-Canada's Tout le monde en parle television show (separately) in October. A Liberal government would invest in big municipal projects in Calgary if elected, Leader Justin Trudeau promised today. 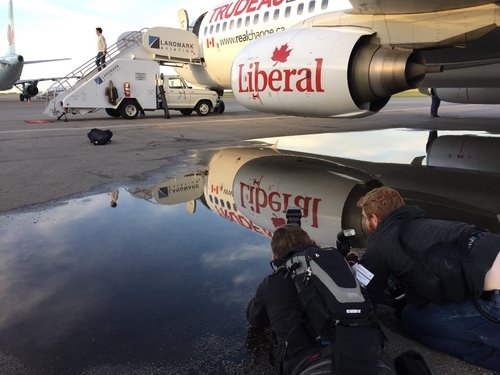 Trudeau announced that Liberals will invest in flood mitigation and continue the $1.5 billion funding for Calgary's C-train expansion. The Liberals are pledging to nearly double infrastructure spending over the next decade to $125 million from the current $65 million nationally. 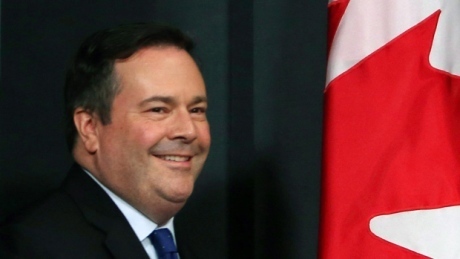 The party is hoping the economic downturn in Alberta will help it convince voters that it's time to turn away from the Conservatives, who have had an iron grip on the province. 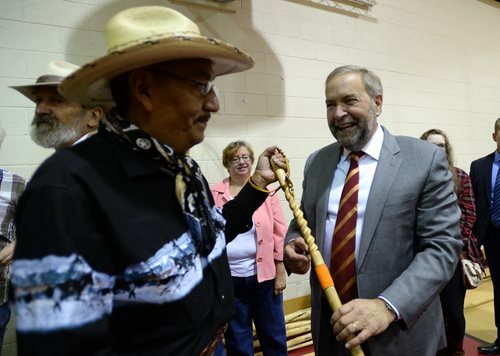 The last time the Liberals won a seat in Calgary was in 1968, and the last Liberal MP was ousted from Alberta in 2006. 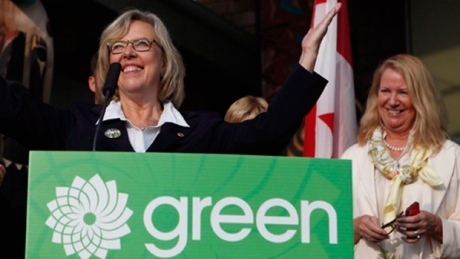 Elizabeth May continues campaign in Guelph, Ont. I'm kind of making a show out of it, but that's exactly the goal. The federal government says it plans to challenge a Federal Court of Appeal decision that quashed its attempts to ban face coverings at citizenship ceremonies. 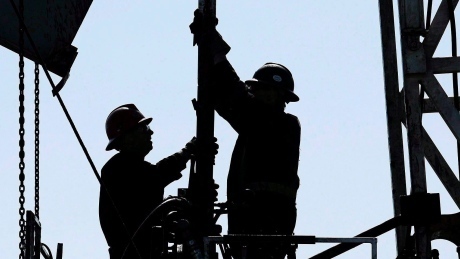 Focusing on economic issues, the latest results from Vote Compass reveal a majority of Canadians support higher taxes for corporations and the wealthy. But they're conflicted about building more oil pipelines. A longstanding theme for the Conservative Party would be reducing taxes on the wealthy or on corporations, but it seems as though most self-identifying Conservatives don't want to take that route. 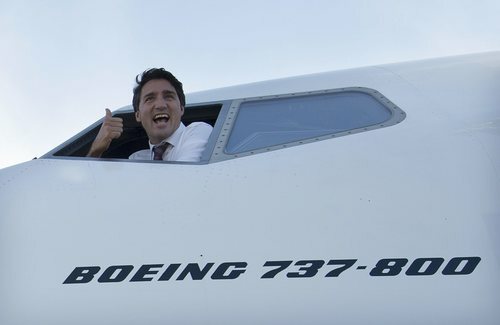 Liberal Leader Justin Trudeau spoke about infrastructure investments in Calgary. Trudeau also spoke about the niqab at citizenship ceremonies. 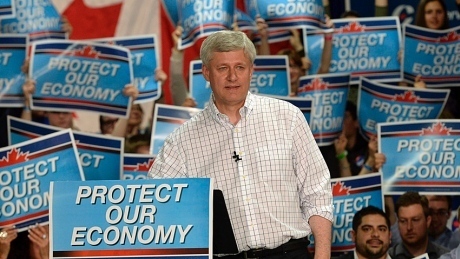 Candidate makes an announcement related to campaign spending promises and the economy. 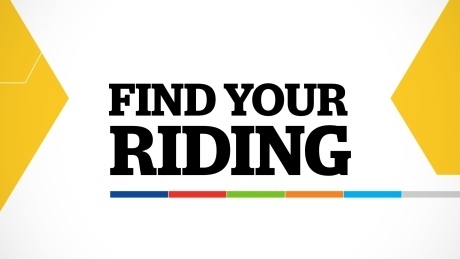 You may live in a completely different riding than last time. Federal riding boundaries have changed since the last election. Input your postal code or zoom in on our interactive map to find out who your local candidates are for the Oct. 19 federal election. Some of Chris Austin's views, as articulated in past comments, are irreconcilable with the values of the Liberal Party of Canada. 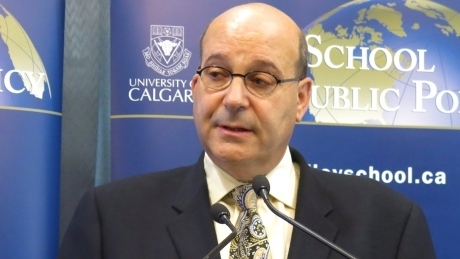 The Liberal Party has removed another Alberta candidate for expressing views that don't conform to the party's values. 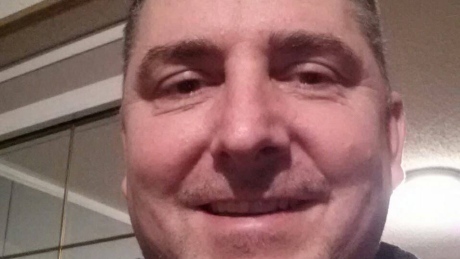 Chris Austin was pulled after Facebook posts came to light. Contrary to popular opinion, fairness and compassion dictate that the tax on large companies should be reduced while the rate on small businesses should be raised. 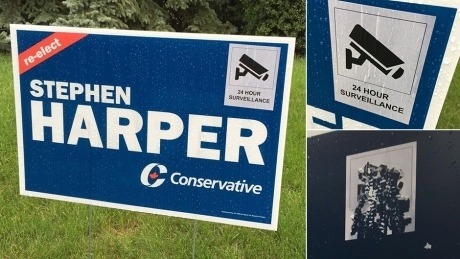 '24 hour surveillance' stickers have been pulled from re-election signs in Stephen Harper's Calgary riding after a member of the local Conservative campaign put them up in an effort to curb vandalism. 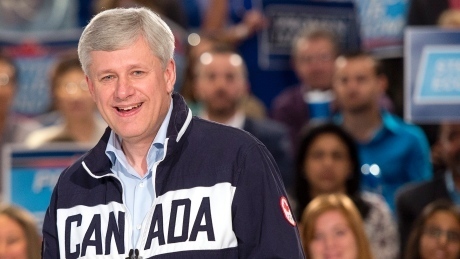 I think it's entirely reasonable to ask, for those 30 seconds, that someone proudly demonstrate their loyalty to Canada. 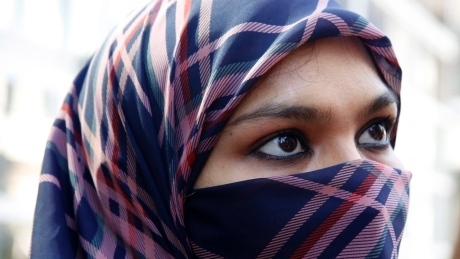 Conservatives doubled down on their position that women should not wear face coverings during citizenship ceremonies, saying the government would take the matter to the Supreme Court, while vowing to reintroduce the niqab ban within 100 days of re-election. Have a question about tonight's debate? 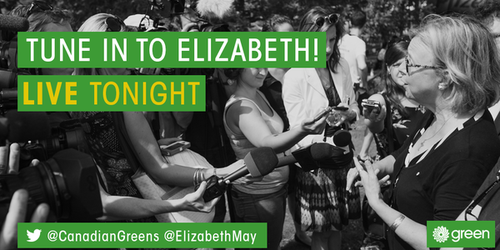 Rosemary Barton, host of CBC News Network's Power & Politics, will join us at 7:30 p.m. ET to chat and answer questions. 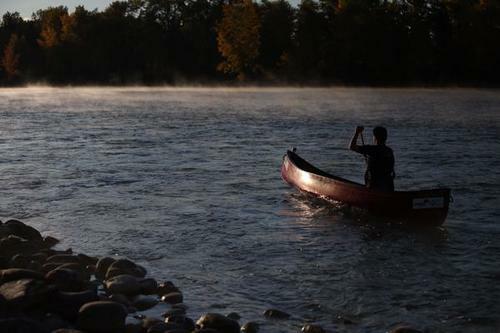 Once the debate on the economy begins, stay with CBCNews.ca for news and developments from Calgary and reaction from across the country. 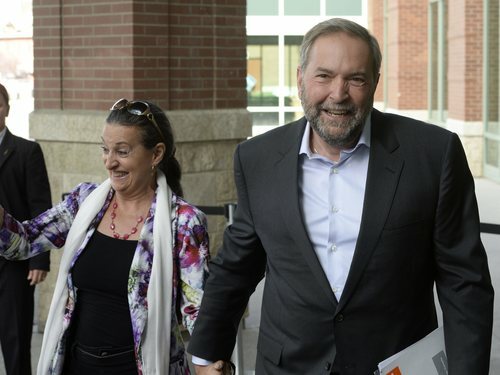 NDP Leader Tom Mulcair and his wife Catherine Pinhas arrive at the debate earlier this evening. 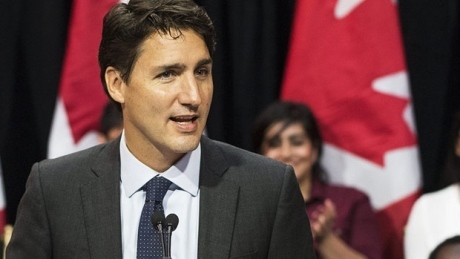 Canadians should get three different visions of Canada's economy as well as three different prescriptions for what ails it when party leaders debate in Calgary tonight. 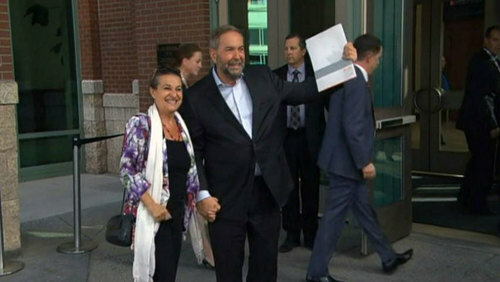 As Chris Hall writes, this is when the real election campaign starts. 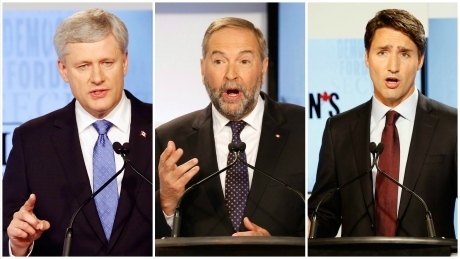 Voters could very well make up their minds based on the debate performances tonight of Conservative Party Leader Stephen Harper, NDP Party Leader Tom Mulcair and Liberal Leader Justin Trudeau. Watch for the D-word, the R-word and the S-word tonight. The polling average has been shifting on a day-to-day basis by no more than a few tenths of a percentage point, with no party enjoying any sort of momentum.